Don’t miss the hottest event on the highest day of the year. 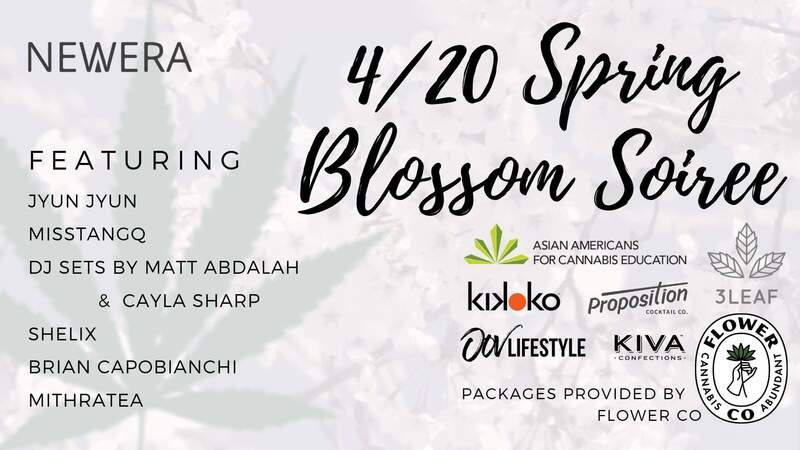 Join us on 4/20 for an evening filled with flowers, fun, festivities, and some funky-funky dance moves at the newly remodeled and oh-so-fresh Hotel Kabuki in Japantown, San Francisco. NEWERA is a cannabis events company based in the Bay Area focused on Conscious Entertainment. Events span across spa experiences, to living room concerts, intimate dinner parties, and sound baths. NEWERA imbues scientific and spiritual study and education of the cannabis plant to empower individuals to develop healthy relationships in alignment with a thrival lifestyle. NEWERA events are inclusive of gender, sexual orientation, cultural heritages, and anyone new or mastered in plant medicine or mindfulness. NEWERA creates spaces to connect and elevate, together. The Flower Company’s mission is to provide members with quality cannabis products and exceptional customer service at the most competitive prices. Jyun Jyun and missTANGQ create multi-disciplinary, interactive installations and performances that bring global perspectives, a reverence for nature, and traditional ritual practices into modern urban life. Uniting music, dance, visual art and new media, they create timely work that inspires and challenges audiences, deconstructing outdated cultural borders with compassion and insight. Their performance ANiMA urges viewers to consider the meaning of home and place in the borderlands of human experience. In the current climate of anti-immigration and divisive sociopolitical forces, ANiMA reminds us that ancestral wisdom and earth-based practices can be a compass, a guiding mythos to help navigate our humanity and harness the power of ritual and communion. Cayla Sharp is a multi-media producer and DJ. She co-founded Fighting Gravity, a blacklight illusion performance group which gained notoriety while competing on America’s Got Talent. From there she collaborated on renowned Immersive Experiences in NYC and Brooklyn. She is currently working on a documentary about queer youth in Utah called Love Over Everything and creating a Show Called Trans Dance with the collective Loud and Queer. Matt Abdalah is an American born Lebanese DJ that combines grooving percussion and melodic harmonies to sooth his dance floors into dance. Expect to hear downtempo and lo-fi house and hip hop from this DJ.